Remember Obama’s 2008 Climate Promises? We recall an American presidential hopeful apparently willing to take on Koch and big oil. Barack Obama’s decision to give Shell permission to drill for potential oil reserves in the Arctic undermined his legacy as the American president who took climate change seriously. The public outcry as he comes to the end of his second and final term in the White House was hoarse with disappointment because of the audacious promises he made when first running for office: that he would challenge coal, oil and gas monopolies and deliver international climate deals. Obama did warn during his first presidential address that it would be an uphill struggle and, over the coming weeks, the American electorate will have to assess how far they have really come. Had ExxonMobil and the Koch oil billionaires successfully tamed the man who was supposed to be the most powerful in the world? The future president was a virtual unknown when he announced his election campaign in February 2007 in Springfield, Illinois. The Hawaii-born Harvard Law School graduate had been a community organiser in Chicago and a civil rights attorney. The Senator was also among the few American legislators who had not (yet) received millions in funding from coal, oil and gas companies trying to spread their bets by funding both Democrat and Republican politicians who might get in the way of their drilling and refining. “I don’t take money from oil companies,” Obama boasted at the beginning of 2008. This was technically true, but oil money did bleed into his campaign. According to FactCheck.org he received $213,000 from oil and gas workers and their spouses. This included $66,000 from employees of the most well-known oil majors, including ExxonMobil, Shell, and BP. In fact, the company formally known as British Petroleum and its employees had donated $77,051 to Obama during his time at the Senate and as a presidential hopeful. The total given to federal candidates exceeded $3.5 million in the two decades before his election. By the end of the race, $916,162 was piped to Obama by the oil and gas industry, according to the OpenSecrets website. His Republican rival, John McCain, was awash with oil money – raising $2,666,842 from the industry. During the campaign, Obama raised $745 million and spent $730 million, so the oil money was a drop in the ocean and seemingly not enough to buy his silence. Writing in Foreign Affairs, the future president described climate change as the “epochal, manmade threat to the planet.” Later he alerted Americans to the potential of “a world where the oceans rise and famine spreads and terrible storms devastate our lands”. In October 2007, he supported a climate change bill and was calling for a graduated cap on carbon dioxide emissions and an auction to sell ‘pollution credits’. “No business will be allowed to emit any greenhouse gas for free,” he asserted boldly. A campaign advert, run in March 2008 in Pennsylvania and Indiana, signalled war against the monopoly of the American oil companies. 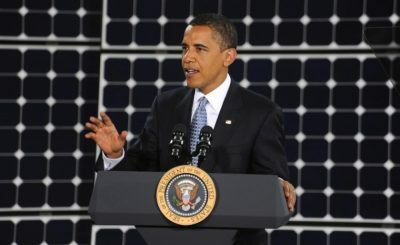 Obama warned about over-reliance on foreign imports and championed energy independence, praising alternative fuels. “Since the gas lines of the 70s, Democrats and Republicans have talked about energy independence, but nothing’s changed – except now Exxon’s making $40 billion a year, and we’re paying $3.50 for gas. He attacked George W. Bush for his reliance on oil, and the fact that gas prices for drivers had exploded. “They had a plan,” he said. “Problem was it was the oil company plan. It was the gas company plan. We need a people plan! And that’s why I’m running for president. And he was not joking. At the same time, he was promising that the US would produce enough clean energy to end Middle East oil imports within a decade. Now a decade has passed, with emissions still rising, will Obama supporters be able look back on the hope and the mania and say, “Yes, We Did”? Featured image is from The Ecologist.